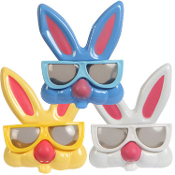 Cute novelty toy bunny mask glasses will keep the little ones hopping at any Easter parade! These Easter bunny rabbit play toy sun glasses don’t stop with hiding the eyes. Each pair also has an attached nose and rabbit teeth, as well as tall silly bunny ears. These make wonderful pretend cosplay costume Easter basket stuffers and fillers. Fun to wear, or as prizes for Easter egg hunts! Delightful novelty funny Bunny Glasses are fun for any Easter Costume or Egg Hunt, sunny day in the park, field trip, zoo, birthday party favors, or any indoor outdoor play activity. *Choose from available colors: *yellow, *white, and *blue. Plastic pvc toy glasses with vacuformed molded plastic Easter bunny ears and lower face with nose and teeth. *Novelty costume glasses only. NOT UV protective or designed for strong sunlight conditions. Intended for play only.